Consulting, you must have heard about it ! If this is not the case, here is a brief definition: " A consulting firm is one that provides advice, guidance or recommendations on what to do. It therefore aims to improve the current and future functioning and performance of private or public organisations. " Consulting is a broad world. It is often difficult for students to distinguish all types of consulting that may exist. IT consulting (Information Technology) is an area of activity that helps clients by developing, implementing and managing the IT system within their company. IT consultants therefore provide their clients with a series of recommendations on how to make the best use of their information systems. They also support the client in setting up good IT tools and in taking charge of projects by bringing highly operational resources to the client. Companies: Big Four (KPMG, PwC, Deloitte et EY), The Boston Consulting Group, Tobania, Adneom, Accenture and others. The audit sector is surely the one that students have heard the most about. The auditor has the professional expertise to make an unbiased judgment on a company's financial statements. It may also pass judgement on the internal control, procedure, organization or any transaction of a company. The auditor's task is often identified with someone who wants to identify fraud within a company at all costs, which is an erroneous image of the business. The auditor is simply there to judge, on the basis of evidence, whether a company's accounts have been properly prepared in accordance with the standards in force. 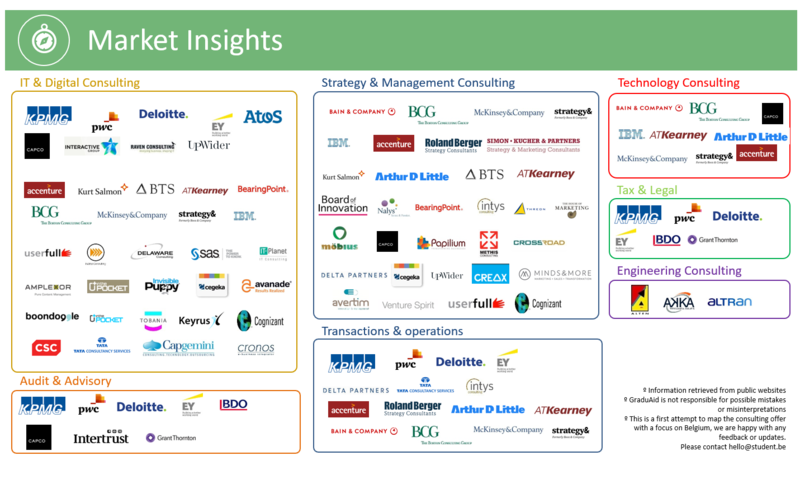 Companies: Big Four (KPMG, PwC, Deloitte et EY), BDO, Capco, InterTrust, Grant Thomton and others. Strategy and management consulting can be distinguished but their scope of action is largely identical. Companies specializing in strategic consulting often extend beyond the management consulting sector. Strategy consulting is designed to provide business leaders (often large companies) with specialist advice on the definition of a business strategy. Strategic consultants work on the company's main orientations (medium and long term) and make recommendations on the very nature of the business. On another side, management consulting consists of setting up processes to achieve the objectives of the general management. Companies: Roland Berger, Bain & Company, The Boston Consulting Group, Mc Kinsey, Accenture, Arthur D Little, BTS, Deployments Factory, UpWider Papilium, and so on. Operations consultants aim to assist companies by improving their performance in their respective sectors of activity, through primary functions (such as sales, marketing, production, etc.) and secondary support functions (such as finance, human resources, R&D, etc.). Operations consulting also helps companies implement services that improve the organization's value chain. Companies: Big Four (KPMG, PwC, Deloitte et EY), Roland Berger, Bain & Company, The Boston Consulting Group, Mc Kinsey, Accenture, Arthur D Little, Intys, ATKearney and so on. Technological consulting encroach a bit on the field of IT consulting. IT consulting is more specific and focuses exclusively on information systems, while technology consulting is more general in nature, bringing together, among other things, the activity of IT consulting to extend its spectrum. The technological consultancy offers advice on softwares, hardwares and other technological elements. They work with customers who are specialists in technology, i. e. software, hardware, IT services, storage, components and peripheral sectors. Companies: Bain & Company, The BCG, Mc Kinsey, Accenture, Arthur D Little, Addestino Innovation Management, IBM, and so on. Tax & legal consulting services are provided by financial experts specialized in tax rules. Companies are sometimes located in different countries with completely different tax systems, the help of a tax expert is highly recommended in such situations. Tax advisors can be used for a number of reasons: either countries use tax advisors to audit the balance sheets of certain large companies, or tax advisors help companies to minimize their taxation and write their financial statements correctly. This avoids companies having to learn the details of tax rules in complex financial situations. Companies: Big Four (KPMG, PwC, Deloitte et EY), BDO, Grant Thomton, and so on. Engineering Consulting is the type of consultancy that provides independent engineering and science expertise for private or public companies. Engineering consultants specialize in different disciplines and provide a wide range of services directly related to engineering such as design, supervision, execution, repair, operation, maintenance, technology, plan creation and more. Companies: Engibex, Alten, Akka, Altran et Adneom. We hope this article has been usefull to you and that you now have a clearer vision of the consulting world !